It Doesn't Matter That I Wasn't There : News & Views Beth Perry, a Los Angeles-based magazine writer, has this week's installment of "Speak Your Mind." Beth Perry has this week's installment of "Speak Your Mind." The Los Angeles-based magazine writer says of yesterday's inauguration, "whether in the streets of Washington or the sofas of Westwood, it was impossible to deny the innumerable shift." At first, I was so disappointed that I didn't want to watch. Due to an overbooked hotel, a delayed cross-country flight, sold-out train tickets and an all-access pass that turned out to be unusable, my plans to witness President Barack Obama's inauguration firsthand fell apart. And so it was with a measure of dejection and frustration that I turned on the television at 7 yesterday morning to watch the festivities from 3,000 miles away. I saw clusters of hooded faces stretched for what looked like miles behind the Capital. I watched Aretha Franklin power her way through a feathery rendition of "My Country, Tis of Thee," festooned with a giant grey-knit-and-rhinestone bow that rivaled the mammoth Bible Jill Biden held as her husband took the vice presidential oath. I marveled at the showmanship of a coatless Yo-Yo Ma, wielding his bow like a majorette's baton, smiling widely even as the 20-degree chill turned his face maroon. And then I saw the future First daughters, dolled up in double-breasted coats, ribbon sashes and puffy gloves, careful not to touch their freshly curled hair. I thought of myself on childhood Easters, covered in ruffles and struggling to focus during seemingly interminable church services. 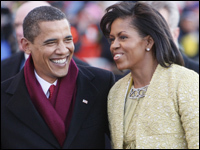 President Barack Obama and first lady Michelle Obama walk the inaugural parade route in Washington, Tuesday, Jan. 20, 2009. I saw Michelle Obama, a vision of French silk and Swiss wool lace, standing tall in her ivy kitten heels cradling a Bible that existed when her great-great grandparents were slaves. She beamed at her husband, all curves and confidence, not a hair out of place, and I thought of my mother, a no-nonsense physician who integrated her tiny Ohio grade-school when she was six. When I saw Barack Obama -- proud, poised, and presidential -- strolling down Pennsylvania Avenue a few feet away from a replica of the city bus Rosa Parks rode in 54 years ago, waving at the world with one hand and faithfully holding his wife with the other, I thought of my grandfather, who spent his teenage years taking my grandmother to movies in the "colored" part of town. I was with him on election night when, dying of lung cancer that had spread to his brain, he woke up from a nap, heard that Obama had won, and said simply: "I knew this was possible." I thought of the blind fear my father felt as a child riding in the backseat when his family drove through Mississippi and remembered the day, shortly after I'd been named valedictorian of my Tennessee high school, that I stopped in a suburban ice cream shop and a 7-year-old boy called me a n-----. When I saw our new president clap his hands in the parade reviewing stand and laugh as our new first lady bounced her shoulders to her high school's marching band, I lost my breath. Suddenly, the most powerful family in our nation reminded me of my own. Was this possible? My culture, my undeniably black experience of pin curls and pantyhose, of edge-ups and electric slides had become presidential. 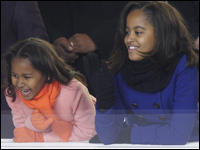 President Barack Obama's daughters Sasha and Malia watch the inaugural parade in Washington, Tuesday, Jan. 20, 2009. The pillars of a happy, loving, unadulterated, successful black family had morphed into unrivaled cultural icons. With a touch of swagger in his gait, Barack Obama had stepped squarely into the annals of history, bringing the consciousness of every person of color with him. I was immediately struck by a visceral sense of validation, an intangible feeling of belonging, when before that moment I hadn't realized I'd felt like I didn't belong. I am not, as they say, drinking the Kool Aid. I realize that like all before him, President Obama is a politician. The systemic cesspool facing his administration will not be easy to fix; some promises will not be kept, and some supporters will be disappointed. But yesterday, as he made "hang-ten" gestures and she two-stepped to Stevie Wonder, when the girls pressed their noses to the bulletproof glass and giggled without self-consciousness, when all of a sudden the public face of my country actually looked a little like mine, none of that mattered. The great James Baldwin once wrote that "there are people in the world for whom 'coming along' is a perpetual process, people who are destined never to arrive." On Jan. 20, whether in the streets of Washington or the sofas of Westwood, it was impossible to deny the innumerable shift, the core feeling that after two centuries of coming along -- of getting better and then falling short, of learning from our mistakes and then repeating them -- that our country, our wonderful, vibrant country, had in some fundamental way finally arrived. -- Beth Perry is a magazine writer living in Los Angeles.